I’ve been attending early morning water-aerobics classes for a month now, and I’ve learned a few things. I’ve already written about the more practical lessons I’ve had, like park in the same place and pack your gym bag the night before. But water aerobics offers unexpected perks in addition to the more obvious health benefits. 1) Water aerobics is a practical lesson in Newtonian mechanics. Since I take a deep-water class, I wear a floatation belt and bob around like a cork. Most of the exercises have balanced motions of the arms and legs so you stay in one place no matter how hard you work. At least a few times each class, I find myself heading for the wall, or worse, another person, when I’m supposed to stay put. I’m amazed at how hard it can be to figure out which part of the move is causing me to travel and how difficult it can be to get things back in balance so I don’t run into anyone. 2) It also teaches you about the theory of relativity. 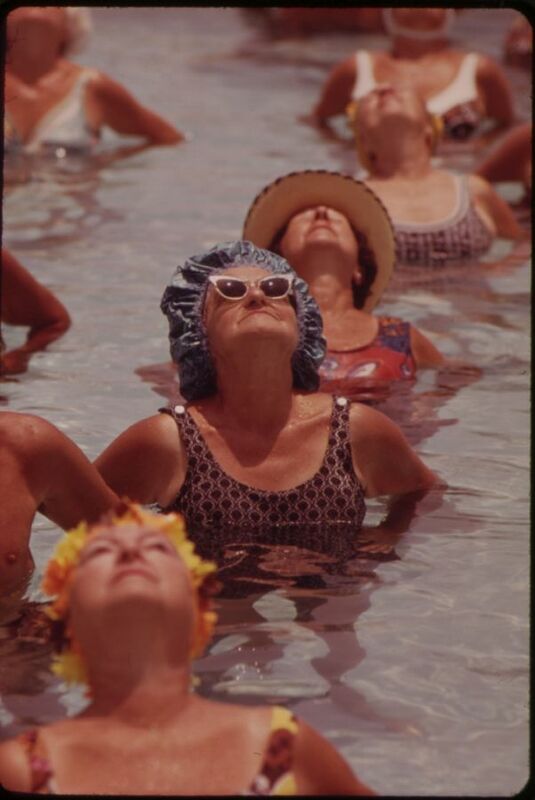 Einstein proved that time is relative, and water aerobics is a great way to experience it personally. The last time an hour was this long, I was a kid waiting for Santa. 3) It attracts fun-loving people. A few weeks ago, the instructor told us to really push ourselves. “I want to see some waves!” So one of the smart-alecks in our class lifted her hand out of the water and waved at the teacher. I still can’t believe that I can laugh so much at seven in the morning. 4) It trains you for a whole new and interesting life. It’s great practice for those interested in being a mermaid or a dolphin. 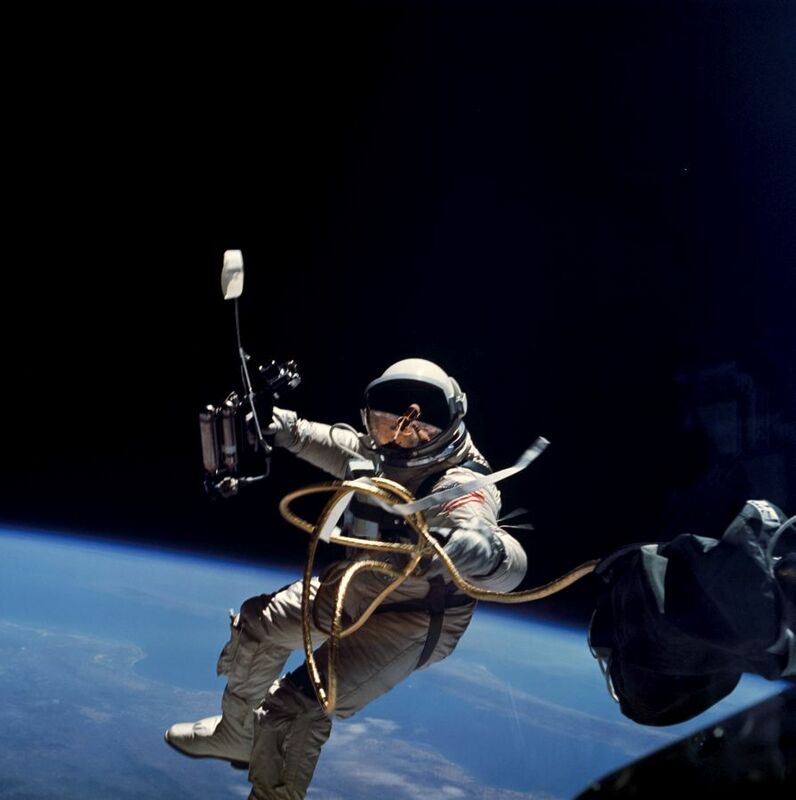 Future astronauts also get plenty of practice maneuvering in low gravity (see number 1). 5) You get to see some hot guys in swimsuits. No, they aren’t fellow classmates. At our gym, there are lap swimmers who use the outdoor pool and come inside to return equipment they’ve borrowed while we are in class. The kind of guy who is willing to swim outside before 7 am on a winter morning tends to be in amazing shape. There’s a reason Tarzan was played by a swimmer. 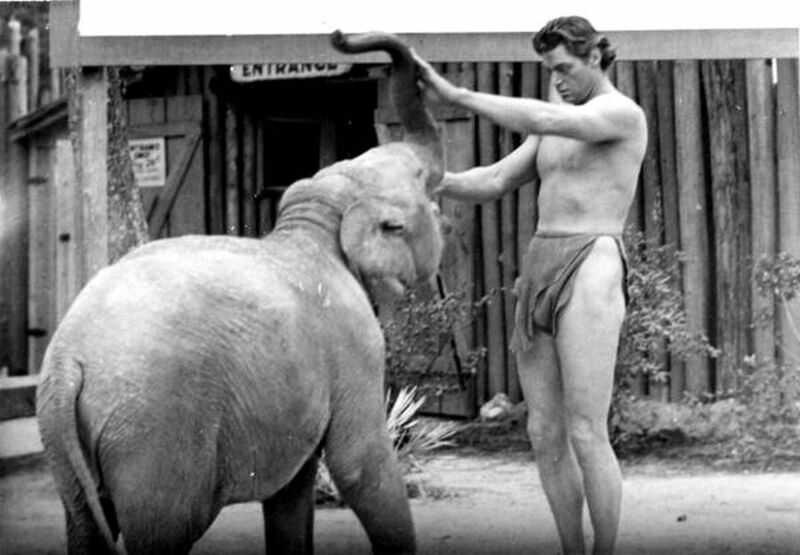 Johnny Weissmuller behind the scenes. The winner of 5 Olympic gold medals, Weissmuller starred as Tarzan in the 1930s and 40s. 6) It’s a time machine. You get transported back to childhood. Splashing and laughing in the pool brings back memories of swimming in the neighbor’s pool on summer days as a kid. I always climb out of the pool feeling younger than I did when I got in. 7) It’s great exercise for the brain. My friendly fellow students know everyone’s name, including mine. It’s made me pay attention and really work on learning who is who. Remembering names is not one of my strengths, and there’s an added challenge when you go from the pool to the locker room — all those floating heads look very different when you see them on land. Suddenly they are also tall or short, fat or thin, and in clothes instead of their swimsuit. Definitely push-ups for my brain. Does your favorite exercise class have unexpected perks? What are they? I noticed this morning.. the result of getting into the pool,, ours is kept at 82 degrees.. which is kind of heart stopping cold until you get moving, So this morning I took the dog out for a walk, freezing cold, wind blowing and I said to myself, you get into a cold pool four mornings a week, you can do this. So I did. I’ve been doing water aerobics for 17 years. At the Y in Ithaca the water temp was almost 82 most days and I’ve done both deep water and standing and running type. The other participants are awesome and we have formed very close, lasting friendships. May 2 I’ll have a reunion with them after 6 months. Here at Southgate the water temp is about 86 but the pool is only 48″ deep. I miss the deep water but here we are co-ed and it’s different. Here I wear my hearing aids in the water, very necessary to hear the gossip and news, and there’s no danger of large waves from lap swimmers. It’s a good workout no matter where you are. I’ve been impressed by how friendly the students are. I’ve never been in an exercise class where the students go out of their way to learn your name. I can’t believe it’s only been a month.